Stilettos Diary: The Leopard and the Brooch. The Leopard and the Brooch. This week's look is totally inspired by the insect brooch I made. Bracelet and Ring - Stilettos Diary Shop. Black sky high heels - Thrifted from Brigade road. Cost me about 1200 Rs. Recently I did a post about Classic Wardrobe (CLICK HERE TO READ!). After the post I am hell bent on achieving an eternal timeless wardrobe that will take me through all seasons. I styled it with the white shirt. 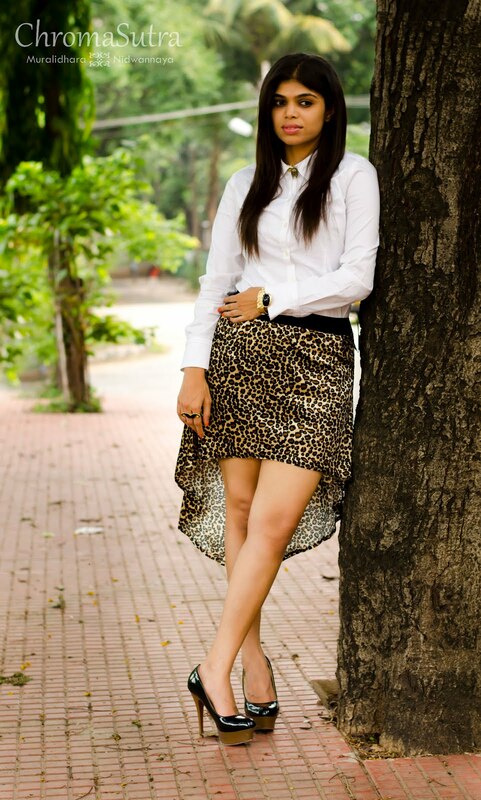 I dint find a perfect skirt to compliment the brooch and white shirt (Searching clothes in my wardrobe is equal to mission impossible) yet I managed to find this leopard mullet skirt. Added arty gold bracelet, moustache ring and sky high heels to complete the look. Leopard print never goes out of style. It again is a versatile piece in your wardrobe and a must have according to me. Shopping tip: Next time you gals go shopping remember to stock up on essential items and of course remember if a garment doesn't fit you well, please don't buy it. Alterations never work out (it can ruin the shape of the outfit) unless you know an excellent tailor who can alter garments. woww.. those heels costed u 1200?? NICE!!! Wow love those heels!! I really can't seem to find nice ones with platforms in my size! I'm a 40 and these Bangkok ones don't do for me! The brooch/ring is such a great idea!! Wow, stunning!! These pictures are amazing :) Thank you very much for your comment, i already am following your blog!! That skirt is awesome! Love leopard print! p.s. hope to see you around more often! OMG! simply fabulous! The skirt is gorgeous and cant believe you paid that price and the fact that you made the brooch from something else is amazing! Color works perfectly and you wear them all beautifully! Kudos! Your outfit is just amazing! Very hot and wild skirt! Love it! You were also very creative with that ring! Gorgeous outfit! i love the brooch! Great outfit and blog! Following you :) Follow back maybe? Great look! I really love your shoes and bracelet. Amazing outfit and pictures! Great brooch! Gorgeous photos! I love the accessories! Love asymetrical length skirts right now. I adore the jewelry in this post! Great blog dear, thanks for your lovely comment! Wowww..gorgeous.Loved everything about the look - skirt, accessories and particularly the pumps...superb!!! Lovely skirt! And the jewelry are great to!! 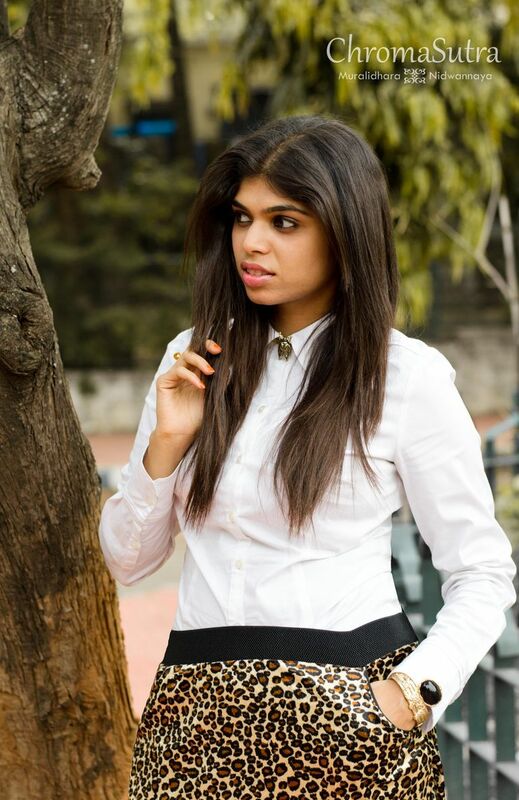 wow i am LOVING your jewelry/accessories in this post and i love the crops white shirt with the animal print. i would have tried to find a simple black belt though to hide the elastic of the skirt. great post though! you look lovely! pretty! I love that skirt!! love it! i love your skirt! I love your style. Great skirt and outfit in general. The broch is super cool. This skirt is definitely a great one! And the white shirt just makes it stand out...plus those heels are killer and make your legs look great! I love your styling and accessorizing, you've got a great blog here :) Definitely following you! You are looking wild in this wild dress. :) Stilettos lady. Stilettos Diary for Denizen India.